Numerous astronomical observations show that matter in the universe is mostly composed of dark matter, which does not emit electromagnetic radiation. The nature of dark matter is still a puzzle so far. Dark matter detection is mainly divided into two kinds: ground and space detection. The main principle of space detection is to detect the products of dark matter particle annihilation or decay, predicted by various theoretical models. Usually, space experiment requires a large volume, heavy and complex particle detector system. Because of the significance of dark matter detection, China has made a long-term space dark matter detection plan. The first step of the plan is to launch a dark matter particle detection satellite, searching for evidence of dark matter particle through high energy resolution observation of gamma-rays and electrons. This mission has been included in the Strategic Pioneer Program on Space Science, Chinese Academy of Sciences, and is scheduled to launch in 2015. IHEP is responsible for the Si-micro strip charge detection system. 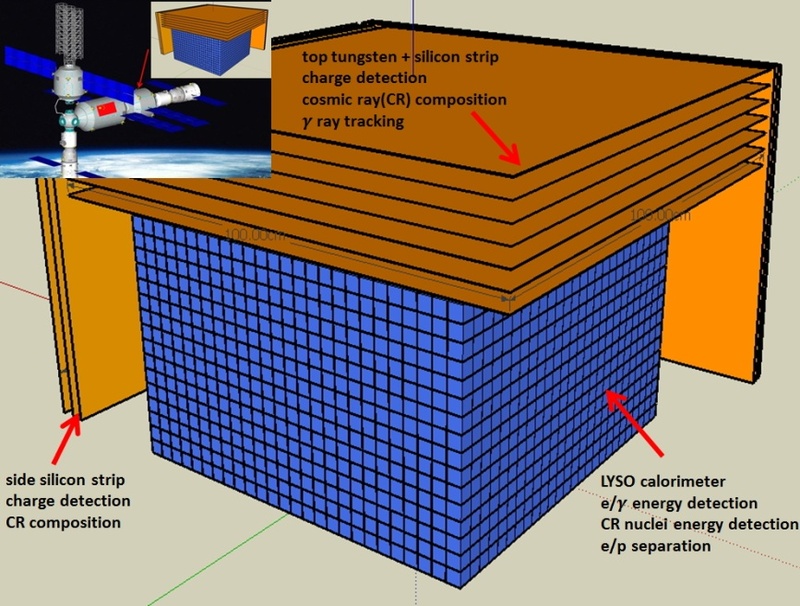 The second step of the plan is to place a large calorimeter, High Energy cosmic-Ray Detector (HERD), on board China’s space station in 2018-2020. The core of HERD is a three dimensional calorimeter with fiber readout. HERD will be the first space instrument sensitive from all five surfaces. Because of this capability, the effective geometric factor of HERD is increased by an order of magnitude, compared to previous instruments with similar weight, size and power consumption. In addition to high sensitivity detection of high energy electrons and gamma rays, the direct detection of primary cosmic ray composition and spectrum can be extended to PeV range by HERD, shedding lights to the puzzle of the origin of Galactic cosmic rays. HERD is proposed by IHEP, which is responsible for most of the R&D efforts of the project and leads the project collaboration. Copyright ©2013-2014 Space Missions Office/IHEP.